Today's post is all about blatant self promotion. Yesterday I did a story about an act of kindness. 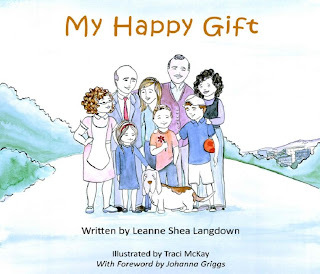 Well today I want to sell you my book "My Happy Gift" which touches on that exact issue. I have written a kids book teaching children how random acts of kindness can bring joy to self and others, with a flow on effect that can impact positively on the lives of many. You can buy it in many on-line stores including The Book Depository, Booktopia and Amazon (just to name a few). I would love to share it with you. It's getting some very good reviews from those who have already purchased it. Check out what others are saying here. This is where you'll also find the Foreword for the book by the lovely and very talented Johanna Griggs. My Happy Gift also has its own Facebook page! Woot woot. You can check it out here. And if' you'd like to grab yourself a copy head on over to my website for purchasing options. Just click on the book below and it will take you there. My Happy Gift! It will make you smile ... and you might just help someone else smile in the process.